These are pretty much standard setters in the Crisps Texture category. They were mostly whole and mostly irregularly shaped. There was skin on edges and the oil blisters featured a scattering of crumbly seasoning. The colour was a gentle yellow but with a little browning here and there. We had to double check the bag after our Nose Plunge Test. 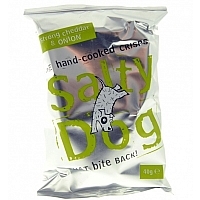 At first we thought the smell was a strong Spring Onion, but no, the bag confirmed it was just Onion. The flavour however still reminded us of Spring Onion, but that may have just been lodged in as false imagery by then. The combination of flavours featured a rounded and strong Cheese, with an even stronger, but not overwhelming Onion. If eaten with a sandwich these would dominate your flavour enjoyment. Which pretty much makes them exactly what they should be, a commanding example of their flavour.